Pneumadyne solenoid valves have made characters dance and “sing” while our quick exhaust valves (QEVs) have enabled paintballs to hit their targets faster. From animatronics to paintball markers, we have supplied pneumatic components for a variety of entertainment and recreation related applications. Pneumadyne understands that standard pneumatic components don’t always fit our customers’ application specifications. We are proud to say that developing custom products that meet defined performance requirements has been one of our priorities for over 35 years. Whether you are developing a new system or improving an existing circuit, Pneumadyne engineers can evaluate your application and develop components or systems that best fit your needs. Learn about how Pneumadyne solved a problem with flush valves on yachts. Contact us for all of your pneumatic component needs. We manufacture a wide selection of our directional control valves, pneumatic fittings and air pressure regulators for use in entertainment and recreation applications. Over 60 quick exhaust valves are available to relieve large amounts of flow in a minimal amount of time. Solenoid operated cylinder control valves are ideal for controlling the extension and retraction of single-acting spring return cylinders. 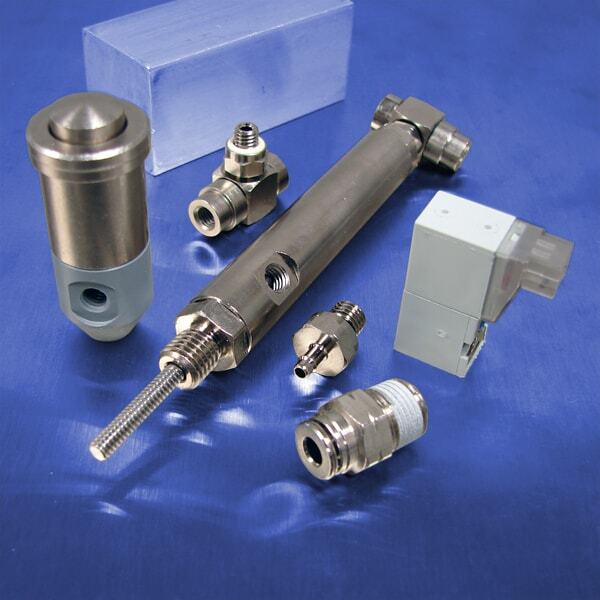 Numerous styles, sizes and configurations of miniature pneumatic fittings are available to connect all of the pneumatic components within your application. The following Pneumadyne components are typically used in entertainment and recreation applications. Check out our full product offering by clicking on the top navigation (in the gray bar above).